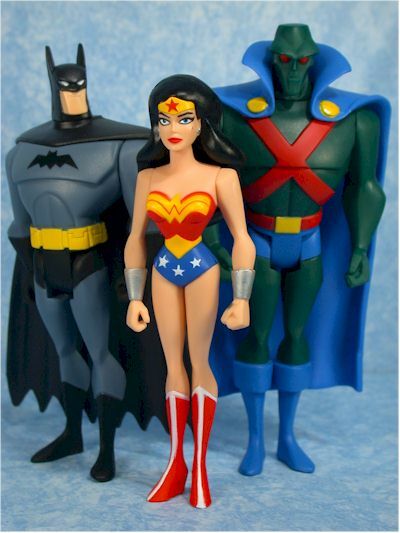 It took me awhile, but I finally came across the final two figures in the second Justice League release. I reviewed the first series awhile ago, but the second series has recently been hitting both Targets and Toys R Us stores. 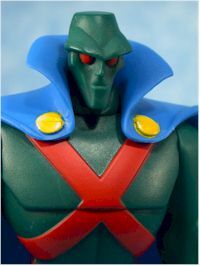 The second series contains a repainted Superman and Batman (both in black costumes) and the two figures reviewed today - Wonder Woman and the Martian Manhunter. Retail on these continues to be in the $7 range, depending on what store you find them at. There is no final word yet on the next figure, Hawkgirl, although she is pictured on the cardbacks. Rumor has it that she may be some sort of Diamond exclusive, but that's not yet set in stone. I discussed the packaging in the previous review, but it's worth it to mention it again. The cardbacks are smaller than the old Hasbro releases, and that's a good thing. Let's face it, space is always at a premium. I also like the use of the 'embossed' appearance on these and the other Mattel Batman lines. They've done this using the bubble itself, and it looks terrific. They are also fairly sturdy because of this, and you aren't likely to see any serious damage on the pegs. 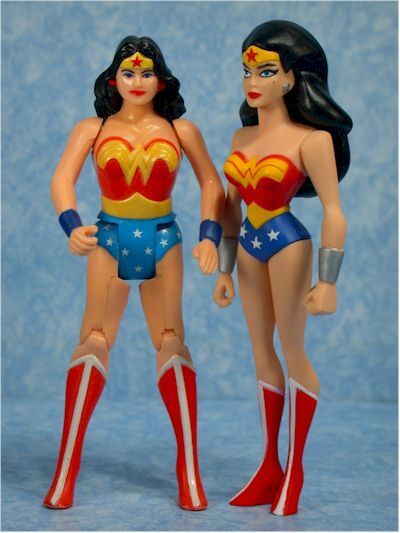 Both sculpts are solid, and extremely close to the maquettes produced by DC Direct. 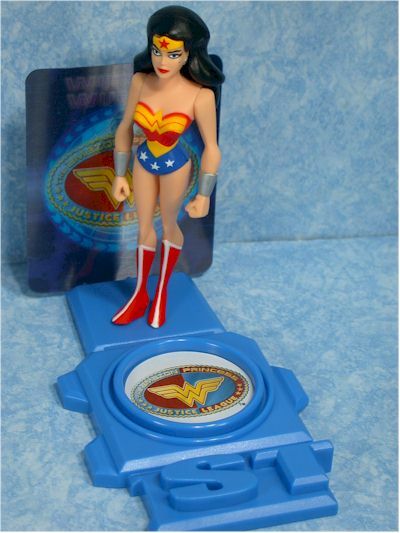 Wonder Woman's stand is a little different, but not a lot. Scale between these figures and the rest of the line is also fairly good, which is refreshing to see. Unfortunately, the paint ops here aren't any better than the first series. While they are a vast improvement over Hasbro's work, especially in the last half of 2002, they aren't up to the quality of many other companies. Areas on Manhunter, particularly with the yellow paint, have sloppy boundaries and bleed. 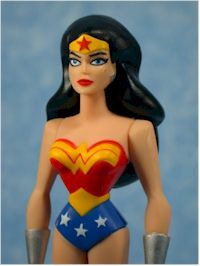 Of the two, my Wonder Woman was the better looking figure from a paint perspective, but there was room for improvement on both. Another area for big concern is the shade of green used on MM. He's way too dark in my opinion, although he'd be set for forest camouflage. Say hello to the new boss, same as the old boss. We get the usual five points - neck, shoulders and hips. No surprises here, but some additional cut joints would go a long way to making these less maquette-like. 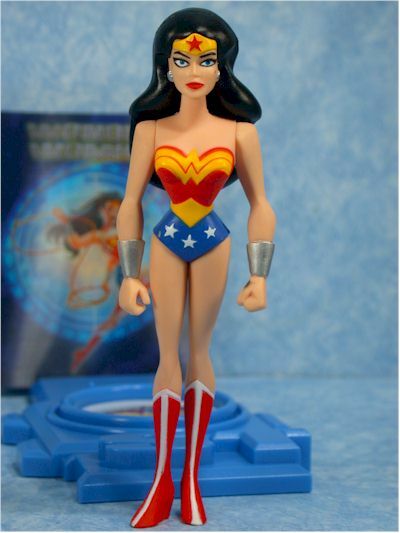 I have heard of some people having trouble over time with the ankles bending on some of the figures. 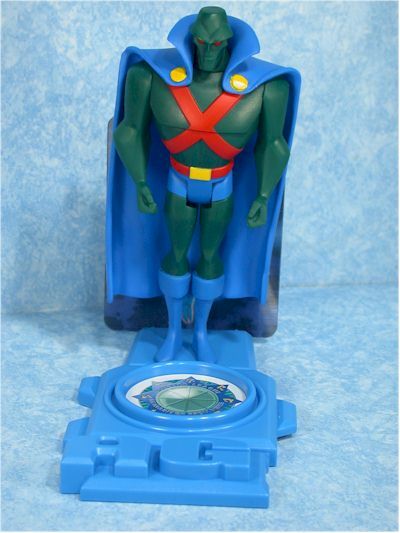 Batman, Superman and MM are the most likely to have this issue, with huge upper bodies and skinny little ankles. I haven't had any issues with any of mine up to this point, but I can see where it could occur. There are two with each figure - a plastic display stand, and a little lenticular card that fits in the back of the stand. The stands fit together (loosely - they don't snap in place) to form the words Justice League. The little cards are fairly nice, although not much of a substitute for a 'real' accessory. At least now with the entire word spelled out, it won't look quite so silly on the shelf. $7 for a fairly basic figures with little in the accessories department is a buck or so too much. Considering what we are getting from other lines in the $7-$8 range, this is not a great deal. You aren't getting ripped off, but you won't feel like you saved a bundle either. Both figures look good on the shelf, and both fit in nicely with the rest of the line. I don't know how far we'll really see these go, but we can always hope to see some of the villains eventually. 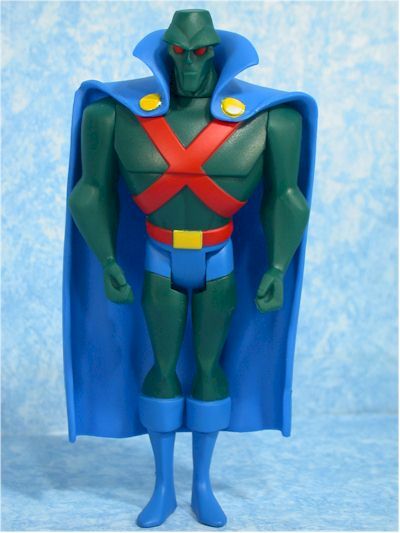 There are some two packs planned - Superman/ Lex Luthor, World's Finest Batman/Superman and Superman/ Solomon Grundy (with another only rumored so far) - along with some very basic 'playsets' and some great looking vehicles. I picked mine up at Target, although I've since seen them at Toys R Us. Those are your best bets right now, although I suspect we'll see them hitting Wal-marts as well.